The Latin species name cardiaca comes from the plant’s reputation in the past as an effective medicine to treat heart diseases. Other Common Names: Common motherwort, throw-wort, lion’s ear, lion’s tail, hjertespand (Danish), Herzgespann (German), agripalma (Spanish), agripaume cardiaque (French). 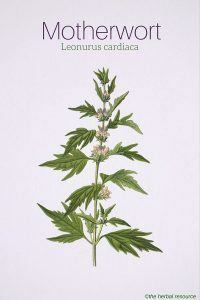 Habitat: Motherwort is found throughout northern Europe. The species is also common in Asia and has been introduced and naturalized in North America, where in many places it is now considered a bothersome weed. Motherwort has been cultivated since medieval times as a medicinal plant which is probably a contributing factor in how widespread the plant has become. The plant thrives best in humus-rich soil in bright sunny places. The plant can be grown from seeds in the spring or early summer or be propagated from the roots in autumn or late spring. Motherwort grown from seeds is too small to be harvested during the plant’s first year but during the second year, it can be harvested twice. Description: Motherwort is a perennial plant that belongs to the mint or deadnettle family (Lamiaceae). It has an erect stem and grows to 50-120 cm tall. The stalks are branched square, hollow and dark red. The leaves are opposite and light green and the flowers are pink or pale purple and contain nectar in abundance which makes them very attractive to bees. The flowers appear in July and August. Motherwort reproduces by seeds. Plant Parts Used: All of the above ground parts of the plant are utilized as herbal medicine. The herb is collected when in bloom before the seeds are formed and then dried for later use in tinctures, liquid extracts, and powder extracts. The herb has a somewhat unpleasant odor and a quite bitter taste. Active Ingredient and Substances: The plant contains alkaloids, flavonoids, iridoids, tannins (5-9% ), terpenoids, citric acid, malic acid, oleic acid, some bitter substances, carbohydrates, choline and a fenolglykosid. When different cultures in different parts of the world use related plants for similar or identical purposes, it is a very likely that there is a rational explanation for its use. 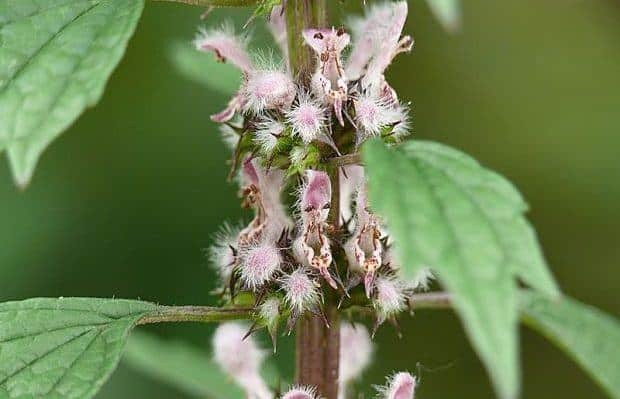 Motherwort and its related species Chinese motherwort (Leonurus heterophyllus) have been used, both in Europe and China to increase blood circulation, regulate menstruation and as a diuretic agent. In Europe, motherwort was also applied as a remedy for menstrual cramps and lowering high blood pressure. There it was also known for its sedative and astringent properties. In China, Chinese motherwort is used to reduce swelling (edema) and for healing by promoting the formation of new tissue. For centuries, motherwort has been used as a medicinal plant to treat heart diseases. The herb has diuretic properties and may inhibit artery calcification formation. It is also used as a remedy for milder forms of Graves’ disease (an autoimmune disease that affects the thyroid) and for hypertension. Motherwort is considered more effective in lowering blood pressure than valerian (Valeriana officinalis), and the plant’s high content of vitamins A and C also add to its beneficial effect. Extracts of the plant have been used as a treatment for mild and chronic cardiac and vascular diseases, especially in the elderly. Many herbalists consider the plant particularly effective in treating palpitations (tachycardia), especially when this is due to anxiety. The herb has been used traditionally for most heart-related problems associated with anxiety, tension, and stress. The German Commission E states that motherwort can be used for irregularities related to the heart caused by overstimulation of the thyroid gland (Hyperthyroidism/thyrotoxicosis). In a world where heart disease is now one of the main causes of death, at least in the Western world, it is strange that the historical or traditional use of both the European and Chinese species of motherwort as a treatment for heart-related disorders has not provided a stronger basis for greater interest and more research on the plant’s health properties. Still, some research exists but more and thorough studies are needed. In one case Chinese scientists found that the herb, or extracts from it, increased the volume of blood circulation, stimulated uterine activity and promoted the flow of urine. Clinical reports also from China (although there are no available controlled clinical studies performed with western methodology) have confirmed this positive results when using the herb to treat heart disease, high blood pressure, irregular menstruation, excessive menstrual bleeding and kidney diseases. Other recently performed studies indicate that the herb has antioxidant, immune-boosting and cancer protective properties. A study done on laboratory animals has indicated that certain alkaloids found in the herb can lower blood pressure and have a positive effect on the central nervous system. 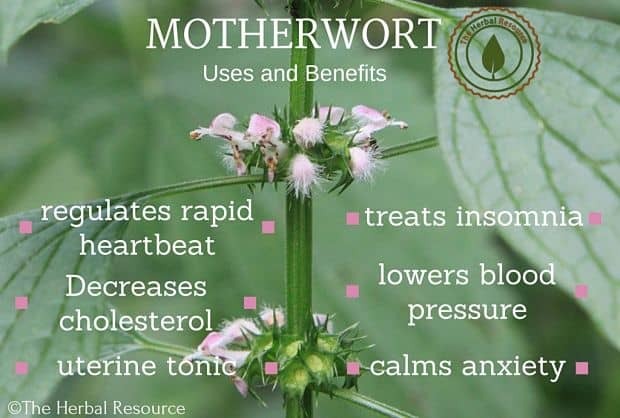 The English common name “motherwort” refers to the herb’s value for women´s related health issues, especially when it is in connection with childbirth. The herb has traditionally been used as a remedy for stress and tension during the later stages of pregnancy and the birth and the postnatal period. It was believed if the herb was ingested two to three times daily until the end of pregnancy, it would promote more coordinated contractions of the uterus. Motherwort has also been used traditionally to treat painful, delayed or missing menstruation. It has been considered likely that two of the alkaloids present in the herb are responsible for promoting uterine contractions. Another claim of the herb is that it can prevent miscarriage, relieve false labor pains, and contribute in bringing the uterus back to normal after childbirth. Laboratory experiments have shown that low concentrations of the alkaloid leonurine, a compound found in motherwort promotes uterine contractions, while high concentrations inhibit contractions. This opposite effect can explain the herb’s ability both to initiate birth and menstruation, and having a relaxing effect on the uterus after birth. Since the herb has a reputation in strengthening the heart, it may be useful during late pregnancy and during the birth, a time when the heart is subjected to high levels of stress. Motherwort is thought to have a calming effect on the nervous system and could be an useful remedy for stress, panic attacks and anxiety. The herb has many of the same health properties as valerian (Valeriana officinalis) and an alcoholic extract or tincture of motherwort is considered to be more effective than preparations made from valerian. Dried herb: 2-4 grams when prepared as herbal tea, usual dosage is three times daily. Liquid extract: 4.2 ml (1: 1 in 25% alcohol), three times daily. Motherwort tincture: 2-6 ml (1: 5 in 45% alcohol), taken three times daily. In spite of the long traditional use and the conflicting information about whether motherwort should be contraindicated during pregnancy, it does contain the alkaloid stachydrine that could expedite birth so the herb should never be used by pregnant women without the supervision of a healthcare professional. Since the herb is known as a heart stimulant it should only be used under a doctor’s supervision, especially for people taking synthetic heart medicine. Motherwort can cause contact dermatitis in certain sensitive individuals. Do not do what I did. I boiled excessively motherwort cuttings and seeds that I bought online and drank it as a tea for several months. I started getting severe abdominal pains, then found out I had blood in the urine. I discontinued using motherwort, but now I need to know how to cure all these side effects! You didn’t list the antihistamine properties of Motherwort. It inhibits histamine production from Mast cells.